If you’ve been following any Android blogs for the past few weeks you’ll be aware that rumors had emerged of a Nexus 5 in a new color: Red. Recent leaks have shown the device in stock. at a warehouse, and ready to ship. Until today, we didn’t know where these were going to be in stock, or when they’d be available, but it appears that it could be as early as next week. Now, you’ll have to forgive me for the next bit. The release date showed up in an internal Sprint (sorry) system. 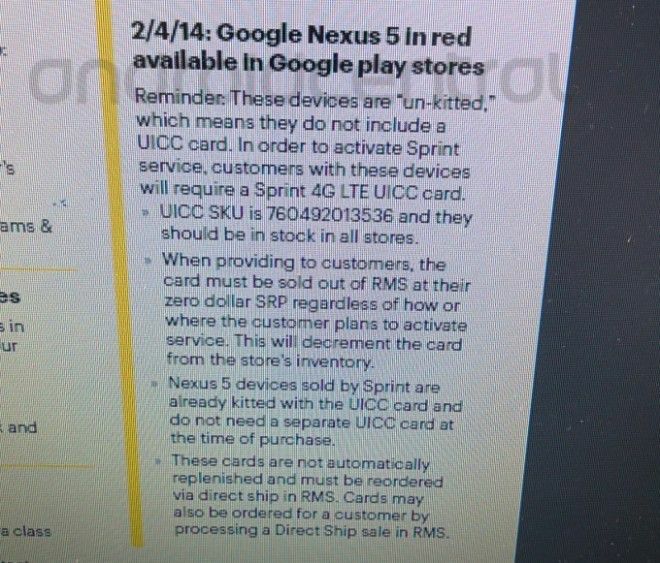 It states that the device is going for sale from Google Play Store on February 4th, and details how Sprint staff need to prepare, and how they should process UICC cards for them. I haven’t heard anything on whether the red variety of Nexus 5 will be available from T-Mobile’s stores yet, but if I do receive any information, I’ll be sure to let you know. In the mean time, if you’ve been holding out on buying the Nexus 5 because you don’t like the black or white editions, maybe red will sway you. I know it’s suddenly got me thinking about getting one. It looks the bomb. ← T-Mobile’s latest marketing stunt – genius or just plain childish? Looks so much better than the white version of the Nexus 4 in my opinion. Agreed. I love the red cover. Got one with my Moto G, looks awesome. The Nexus 5 white in person is more of an offwhite/ cream color.. Not really an optic white. I just got the N5 a few weeks ago in black. I dont think this would change my mind much. Besides if i wanted Red i would purchase the dbrand red carbon fiber cover. I was thinking the same thing although, I haven’t purchased a N5 yet. Should have released this last week so it would have been shipped in peoples’ hands by today. I bet that would have gone over extremely well. Why today? Maybe red is in time for Valentine’s Day? Lunar New Year. Red is a very lucky color. I would have preferred red, but my red TPU case makes the white one look similar to the photo, so I’m good. You’d think more manufacturers would launch with more than just black/white/gray..
Off topic but does anyone know why tmobile and john legere tweeted about Good Morning America? I guess something is going on tomorrow morning during the show but not sure what. Z1 comes in black, white and purple. I had a purple XZ and would have preferred a purple XZ1 but opted for white on that one. I didn’t want to wait for the purple one to be released. Why not just use a case? Most people would just put a case on it anyhow. are really cool looking. Once a case goes on them,u can’t tell. Not everyone puts their phone in a case. You know T-Mobile hasn’t had a pink phone in quite some time. Spray paint whatever you want.